It’s the golden age of Bluetooth speakers, so we set out to find who makes the better bigger box. You’ll find Bluetooth speakers everywhere these days, and at every size and price point. Sure, they might have started life as the poor relations to king-of-the-hill Sonos and Apple’s AirPlay family, but as we found the last time we looked at the market, today’s Bluetooth speakers sound pretty darned good. 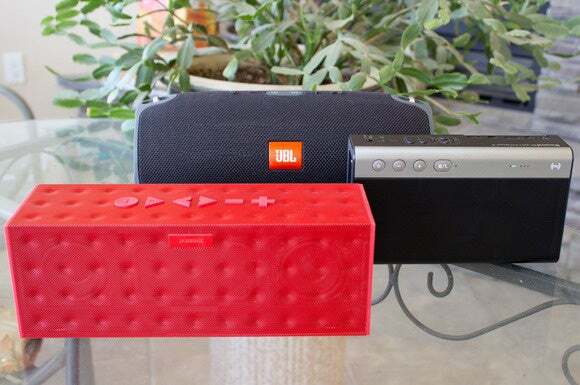 Our earlier comparison looked at two small Bluetooth speakers, so we stepped up in size this time and lent our ears to three much bigger speakers: Creative’s Sound Blaster Roar 2, Jawbone’s Big Jambox, and the beastly JBL Xtreme. Jawbone recently slashed the price of its Big Jambox from $300 to $200, but Creative is being even more aggressive with its Roar 2, pricing the portable speaker at just $170. JBL’s Xtreme is indeed an outsized portable speaker with a price to match: $300. But despite the fact that I’m not enamored with its over-emphasis on bass response, the Xtreme would be my top recommendation if you’re looking for a large portable speaker that you can take outdoors. Creative’s Sound Blaster Roar 2 is a great little speaker for the money, and it’s jam-packed with delightfully unexpected extra features.